Becoming a practicing, licensed architect is a long process that takes several years to complete even after graduating from an accredited college program. Becoming an architect is a hard, time-consuming path and not everyone that completes a degree in architecture, be it a Bachelor's or a Master's degree, decides to become a licensed or registered architect. To become a licensed architect, in addition to receiving a degree, an architect must complete almost 2,000 hours of on-the-job training under direct supervision of a licensed architect. Only after recording the experience with the National Council of Architectural Registration Boards (NCARB) is a prospective architect allowed to register for the Architect Registration Examination (ARE), which is a grueling seven section, 34 hour exam that covers a myriad of topics spanning from Professional Practice, Design and Planning to each individual architectural phase as well as Building Systems and Engineering. Once the Architect Registration Examination (ARE) has been passed, which generally takes upwards of a year to study for and successfully complete, some states require a supplemental exam to practice in that particular state. The overall process of acquiring a professional degree, interning with a licensed architect, and completing the required licensing exams can often take ten years or more. Even after the prospective architect has met the education, professional experience, and national and state examination requirements as well as applied for and received a license, practicing in another state or jurisdiction can be complicated. In the U.S., there are 55 licensing boards in all. Each have their own reciprocal process including in a lot of cases another supplemental exam, such as the California Supplemental Examination (CSE) required by the California Consumer Affairs and the California Architects Board. In the United States, it is illegal for someone who is not registered to call himself or herself an architect. Only "Registered Architects" have the legal right to call themselves an architect and/ or offer Architectural Services in any manner. If you have a question of whether or not the person you are considering working with is a licensed architect, looking up their name within each State Architects Board is an option or you can research through the National Council of Architectural Registration Boards website. It should be very easy to verify if someone is a Registered Architect or not. What does the suffix AIA, FAIA or RA mean? AIA stands for the American Institute of Architects, FAIA means the person is a "Fellow" of the AIA and is someone with a recognized or has had a distinguished career. RA simply means Registered Architect. Once an architect is registered they have the privilege of using RA as a suffix. If an architect is a paying member of the American Institute of Architects (AIA), then they can legally affix that abbreviation to their name as well. Some architects don't belong to the AIA or utilize RA after their name, but it doesn't mean that they are not licensed and they may have all of the same legal rights. What is an architect's stamp? 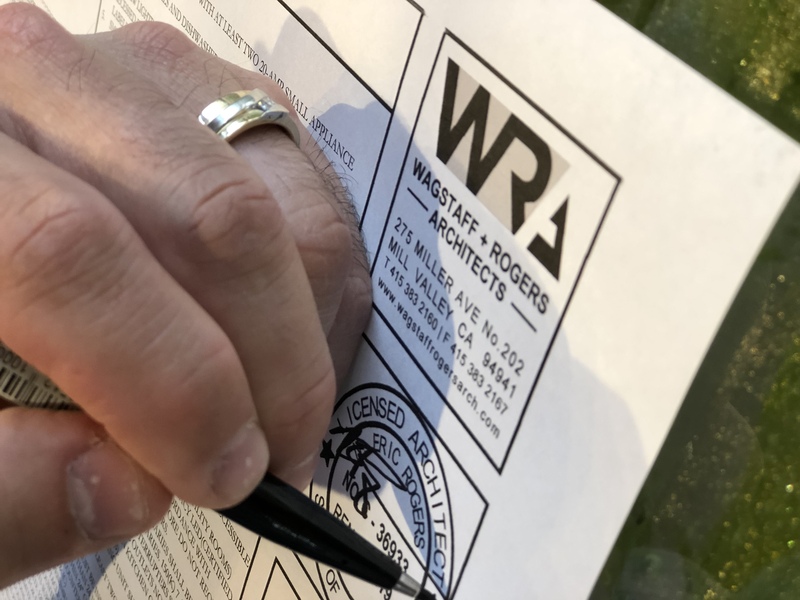 If an architect stamps a drawing, calculations or other document it is a symbol that demonstrates that an item is produced by a licensed architect and is recognized as the authority for that project by local agencies such as the Planning Department and/or Building Department. The item that is stamped is a legal document and the person that stamps the drawing is the "Architect of Record." Some people professionally trained in architecture will call themselves "unlicensed architects" or "junior architect." Being educated (sometimes with a Master's Degree), but not having an actual license makes it really hard not to call yourself an architect. However, without having a license, one is technically and legally not an architect. In the US, people who are Registered Architects are the only ones who can legally call themselves an architect. That said, when hiring an architect consider this: you wouldn't hire an unlicensed lawyer, financial advisor, or an unlicensed contractor, would you? Would you use an unlicensed doctor, accountant, or pharmacist? So, if you answered "no", it is obviously wise to hire a licensed architect. In summation, to answer the question: why hire an architect? We are trained to help identify design solutions that meet the requirements in size, function and form, of our clients as well as regional building regulations. And, we are capable of completing the design for projects of varying scale and scope under the current building codes and local planning ordinances. We also coordinate and manage complex design teams and engineers as well as coordinate with many different construction professionals to create successful, beautiful and safe buildings for the health, safety and welfare of its occupants (structural integrity, soundness of the building and site) that are within compliance of local zoning requirements and building codes. An unlicensed individual does not have the same training, logic, background and experience, or the authority and commitment to the laws that govern that jurisdiction. The expertise and design perspective that a licensed architect brings to a project is invaluable to the building process as well as the space in which people live, work, and use for recreation on a day-to-day basis.